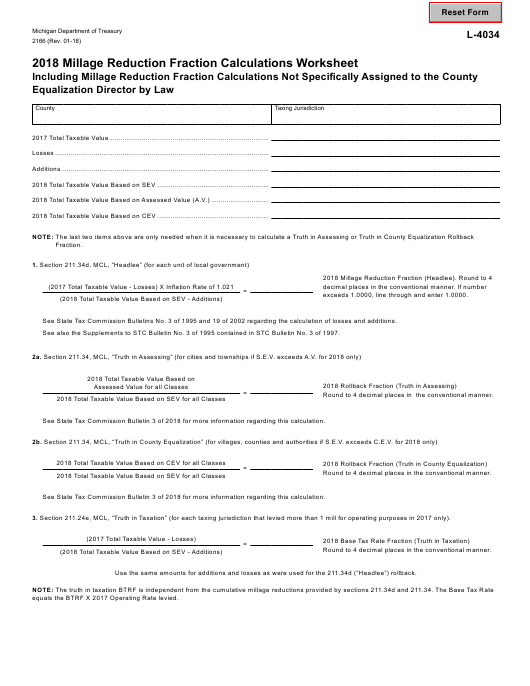 Form 2166 or the "Millage Reduction Fraction Calculations Worksheet" is a form issued by the Michigan Department of Treasury. The form was last revised in January 1, 2018 and is available for digital filing. Download an up-to-date fillable Form 2166 in PDF-format down below or look it up on the Michigan Department of Treasury Forms website. exceeds 1.0000, line through and enter 1.0000. See State Tax Commission Bulletins No. 3 of 1995 and 19 of 2002 regarding the calculation of losses and additions. See also the Supplements to STC Bulletin No. 3 of 1995 contained in STC Bulletin No. 3 of 1997. Round to 4 decimal places in the conventional manner. See State Tax Commission Bulletin 3 of 2018 for more information regarding this calculation. 3. Section 211.24e, MCL, “Truth in Taxation” (for each taxing jurisdiction that levied more than 1 mill for operating purposes in 2017 only). Use the same amounts for additions and losses as were used for the 211.34d (“Headlee”) rollback. equals the BTRF X 2017 Operating Rate levied.